Cabarete is a charming seaside town on the North Coast of the Dominican Republic. Despite the petite size, Cabarete boasts of seemingly endless tropical shores. With five main beaches all within 10 minutes of each other, explorers, relaxers, and watermen alike can get more than their fill here. Referred to as our back yard, Cabarete Beach is located on our doorstep and spans all the way to the east point of Cabarete. This is the longest of all our beaches and is known as the central for restaurants, bars, and boutique shops. Straight in front of our hotel, the warm Caribbean ocean is the perfect place to cool off, and with the reefs a few hundred meters out, you don’t need to worry about stepping on anything prickly in the shores. The mornings are often windless, making the butter-flat water a haven for stand-up paddleboarding, kayaking, and snorkeling. All of which are available for rental at Cabarete Windsports Club, our on-location watersports school. By the afternoon, the bay is a hive of activity with kitesurfers, windsurfers, and sailors all enjoying the consistent trade winds. Don’t know how to kite or windsurf yet? No hay problema! Just sign up for lessons at Cabarete Windsports Club. Located slightly west of town, Bozo Beach is the place for bodyboarders, bodysurfers, and advanced surfers looking to escape the crowds. Its sandy bottom and large shore break are entertainment for many; however, it is important to note that while body surfing Bozo is tons of fun, bigger waves are a sign of a stronger current, so it is best to stay aware of your surroundings and use your common sense. We always suggest you swim with a buddy and stay in line with a prominent stationary object, like a building or tree, on the beach. When the wind picks up, this is a popular spot for kitesurfing with lots of ocean space and a not-too-distant reef that delivers epic waves for those riding directional boards. There are also a few restaurants, bars and kitesurf schools along this stretch of beach. Continuing westward through our beach stroll, you will find yourself at Punta Goleta. This area is arguably the most tranquil of all the beaches, mostly because it is not an ideal location for kitesurfing thanks to the choppy waters and shallow reef in this area. The lack of pedestrians makes it the perfect place for skimboarding! Even if you’re not a skimmer yourself, it’s a great spot to sit and watch the guys and girls twizzling and turning in the shallows! There are not as many properties and restaurants on this stretch of beach, nevertheless, it’s a great place to sit and watch the world go by! The start of Kite Beach is the most recognizable with the rocky point, often decorated with shells and jewelry from local inspiration, Dido. As you reach ‘The Point’ and round the corner, you’ll discover the kiting oasis. The reef at this spot creates some delectable waves for directional and strapless riders all while protecting the flat water on the inside. At low tide, there can be some areas of the reef closest to the point which can be sticking out of the water, so always pay attention and keep an eye out to avoid any shallow or dry reef! Kite Beach is world-famous, so it can get busy with both beginners and pros at certain times of the year. But once you get into the rhythm, you’ll find you have plenty of space. This is a more intimate beach that still hosts a decent variety of kite schools and restaurants. During no-wind mornings, Kite Beach is glassy and flat, perfect for paddleboarding, swimming, and snorkeling. If you’re an advanced paddleboarder, you shred some world-class paddle surfing waves on the reef. From our hotel, this walk takes 30 minutes and is extremely popular for sunrise and sunset strolls. If you’re a watersports fanatic, you probably will already know about that magical place with 350 surfable days a year, if not, welcome to Playa Encuentro. Located just a 5-minute moto or taxi ride away, the winding roads leading up the beach are an insight into the beauty of Encuentro with vast greenery and wild horses roaming freely. At the beach, you’ll notice a good selection of surf schools all offering lessons and rentals, and a few small restaurants offering snacks and drinks. 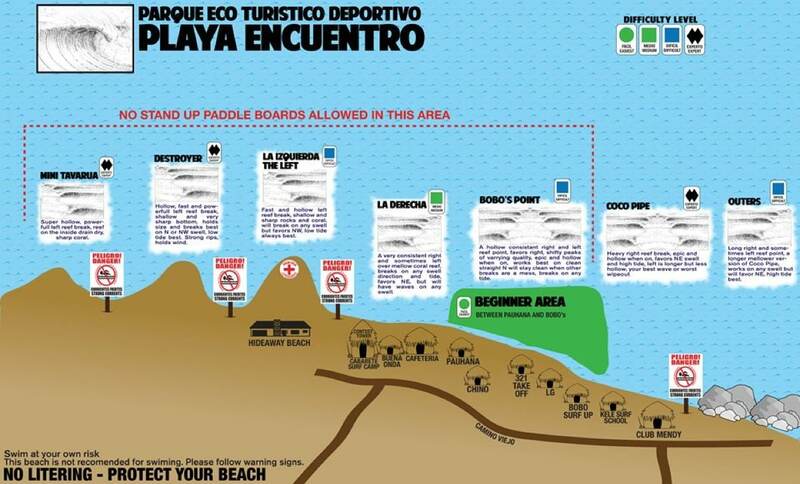 The waves at Encuentro are perfect for beginners and pros alike, offering various breaks for different abilities. We’ve included a little map to point out each break, and it’s level, however, if you’re not sure, one of the surf schools will be happy to help! This spot is not ideal for swimmers as it can be very rocky underfoot and can get quite wavy close to shore. Always remember, as the waves get bigger the current also gets stronger. The waves breaking relatively close to shore, it’s easy to spectate and admire the talent! Encuentro also happens to be our favorite picnic spot! Once the wind picks up, the surfers leave, and the kitesurfers move in. We only recommend this spot for more advanced kiters since the waves can get pretty big.